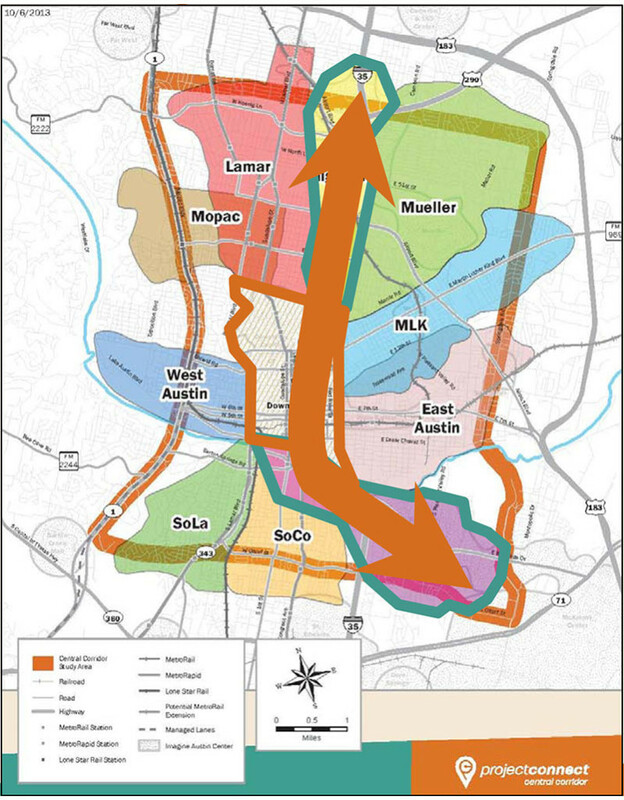 I extracted this map from the PDF of PowerPoint presentation, which was authored by “grosss” (Scott Gross of the Austin Transportation Department) and dated November 15, 2013 at 10:18AM. 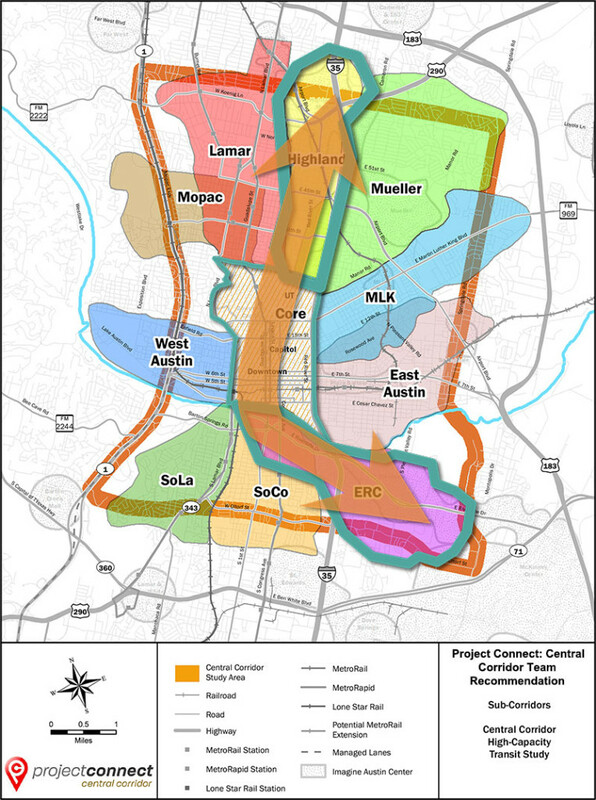 You’ll immediately notice that despite the arrow being almost a mile wide, this map gives visual lie to the notion that West Campus was included in the “Core” to ensure that it is served regardless of the subcorridor recommendation. Even if they procured magical rolling stock with a mile-wide gauge, riders would still have to hoof it another mile west to get from the line to West Campus. This one is from the current PDF on the Project Connect website. It doesn’t have an author in the metadata, but is dated November 15, 2013 at 4:21 PM. In the six hours following the presentation, the recommended path through the “Core” moved a great deal to the west. The arrow is still a mile wide, but if you squint, you can almost imagine this alignment serving West Campus on it’s way to Mueller Highland. It’s also likely that there was another, earlier, “official” version which featured the original path but the same translucency in the arrow. It’s not available now, but Stephen Smith’s article at NextCity.org shows the eastern path and has the translucent appearance. The filename there indicates that he captured it as a screen shot. So what we have is another example of deliberate obfuscation by the Project Connect team. They created the original map for the CCAG presentation. Then made a prettier version of it for broader consumption. And then silently updated that version with a significant move to the west. This kind of behavior is exactly why the public has so little trust in the process and the Project Connect team. And the worst part is, they’re not doing themselves any favors with this move. When the actual route comes out, and it shows the same eastern alignment as all the other proposals of this millennia, they’re just going to have more egg on their face.